Two managers for every nurse: is this our NHS? "[The NHS] is stuffed with managers, for every nurse, there's two managers ... 48% of people who work for the NHS in England aren't clinically trained"
"A new year must herald a new start for the NHS". That was the view of a number of NHS leaders last year, looking back on what some quarters have deemed an 'annus horribilis' for the health service. And while the opposition continues to remind us there are fewer nurses now than at the election, the government counters this by claiming there are more doctors and fewer bureaucrats since they came to office. Yesterday, the UKIP deputy leader took a different slant on the figures: rather than look at the trend, what's the actual composition of our NHS? Actually counting NHS staff isn't as simple as you might think. 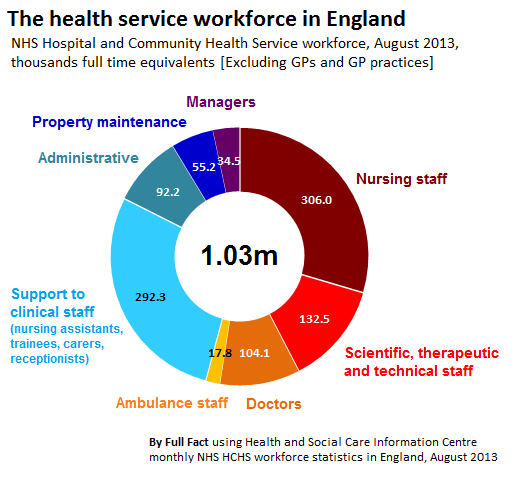 The NHS count their staff using two main indicators: 'headcount' and 'full time equivalents'. Headcount is what it sounds like: the actual number of different people working in the NHS. But this will be a mixture of part time and full time workers. So if there are 50 doctors and 100 nurses at work, it's not necessarily all that informative to say there are twice as many nurses if all those nurses just work part time while all the doctors are full timers. That's what 'full time equivalent' measures are for - they count the 'effective' number of staff based on how many hours they're actually working. 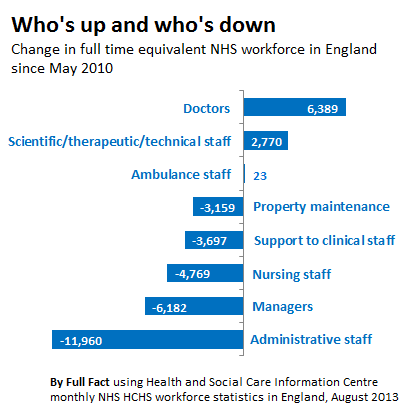 Figures are also only readily available for NHS staff in England. There are figures for Scotland, Wales and Northern Ireland, but these aren't necessarily comparable with the categories used in the English numbers. Assuming he was referring to England, Paul Nuttall's claim that 48% of NHS workers aren't clinically trained is true if you simply count heads. 1.2 million people work for the NHS. 628,000 are clinically qualified in some way: so including doctors, nurses, qualified technical staff and ambulance workers. The other 556,000 aren't clinically qualified, including support staff, trainees, managers or administrators. That's a 53%-47% split in favour of clinically qualified professionals - roughly the figure being used yesterday. The full time equivalent count is very similar: a 54% to 46% spilt, but indicating that non-clinical staff are slightly more likely to be working on a part time basis. This isn't the case, at least from what the staffing figures tell us. Counting full time equivalents (so that actual working hours are factored in) there are 306,000 nursing staff working for the NHS. If you exclude midwives, health visitors and school nurses - who have different roles to standard nurses - there are 275,000 nurses. However while the number of non-clinical full time equivalent staff - some 475,000 - outnumber nurses (though far from being double), only 23,000 are managers and 11,000 are 'senior managers'. So there are actually eight or nine times as many nurses as there are managers in the NHS (and similar is true if you count heads rather than full time equivalents). It's possible the UKIP deputy leader meant to refer more widely to 'bureaucrats' working in the NHS. The Prime Minister often frames non-clinical staff in this way when he describes the Coalition's record in office. 'Bureaucrats' in the sense the government refers to it means taking managers and senior managers and adding in administrative staff and staff involved in maintaining NHS buildings and vehicles. It's not obvious that most people would call everyone working in maintenance 'bureaucrats', but even all these people together total 182,000 full time equivalents - still far less than the number of nurses. Until we hear any more details from UKIP, the claim as it stands doesn't reflect what the numbers say. Are there fewer NHS bureaucrats under the Coalition?